The author, Dan Pedersen, does an excellent job of showing the reader the development of American Naval History as it pertains to current United States philosophy: towards projection of naval power using aircraft carriers. These played a large, dynamic role in Cold War politics, which continue to affect us today. Aside from some personal opinions and feelings you may not agree with, Pedersen gives valuable insight into historical events that have shaped and continue to shape our world today. Pedersen takes readers on a colorful and thrilling ride -- from Miramar to Area 51 to the decks of aircraft carriers in war and peace-through a historic moment in air warfare. He helped establish a legacy that was built by him and his "Original Eight" -- the best of the best -- and carried on for six decades by some of America's greatest leaders. 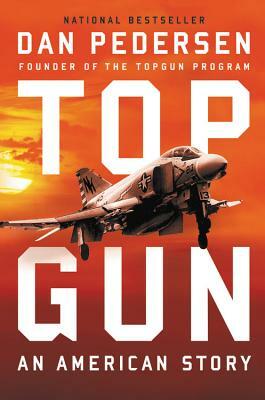 Topgun is a heartfelt and personal testimony to patriotism, sacrifice, and American innovation and daring. Dan Pedersen entered the U.S. Navy in 1953. He was the senior officer in the group of nine men who formed the Navy's legendary "Topgun" program at Naval Air Station Miramar in March 1969. He served in combat during the Vietnam War, with a flying cruise on USS Hancock (CVA-19) and three on USS Enterprise (CVN-65). He retired as a captain, having accumulated 6,100 flight hours and 1,005 carrier landings while flying 39 types of aircraft. He lives with his wife outside San Diego. "Capt. Dan Pederson became one of a handful of aviators who convinced Navy brass that a change in tactics was essential....The lives he saved though Topgun training earn him the title of American Hero." pilot told by the man who started it all!"